Noodles are strips or strands cut from a sheet of dough made from flour, water and either common salt or a mixture of alkaline salt. Noodles consumption represents about 40% of the total wheat flour which are mainly consumed by school children. The use of composite flour has been encouraged since it reduces the importation of wheat. Utilization of locally available, inexpensive materials like cocoyam that can substitute a part of wheat flour without adversely affecting the acceptability of the product will be a product development. This study therefore studied the chemical composition and organoleptic properties of instant noodles from the blend of wheat and cocoyam starch. Cocoyam starch was substituted into wheat flour at 20, 40, 60 & 80%. Analysis revealed higher carbohydrate (63.50-70.05)%, moisture (4.54-5.07)% and vitamin A (10.01-30.47) mg/100g, B1 (11.43-32.15) mg/100g but lower protein (4.56-8.79)%, phosphorus (0.34-0.52)%, calcium (1.83-0.98)%, iron (0.15-0.32) % and ash (1.19-3.20)%. The composite noodles revealed higher carbohydrate and mineral but lower protein than the commercial noodles. The sensory analysis revealed that 20% cocoyam compared favourably with the commercial noodles in terms of all the sensory attributes evaluated. This shows the possibility of producing noodles from cocoyam tubers which serves as novel food. This will further help to promote and improve utilization of cocoyam tuber. Wheat is a good source of vitamin B1 (thiamine), B2 (riboflavin), niacin, B6 (tyrodixine), E (Tocopherol) as well as iron and zinc . Most of these nutrients are concentrated in the outer layers of the wheat grains and a significant proportion is lost during the process of milling . It is for this reason that some countries like Thailand have instituted the fortification of noodles with essential micro-nutrients such as iron, iodine, vitamin A, etc. . Wheat noodles can be fortified with nutrients from cheap plant foods such as cocoyam (Colocosia esculenta). Cocoyam tubers (em>Colocosia esculenta) are grown in the tropics and sub-tropical regions of the world particularly in Africa for human consumption, animal feed and cash income for both farmers and traders [4,5]. Cocoyam is vegetatively propagated using the corms and to a lesser extent the cormels. As food for human consumption, the nutritional value of the various parts of cocoyam is primarily caloric . The underground cormel provide easily digested starch and the leaves are nutritious spinach-like vegetable, which give a lot of minerals, vitamins particularly thiamine . In Nigeria, cocoyam is regarded as a major crop especially in female headed households. Nigeria is one of the largest producers of cocoyam in the world contributing about 40% of total annual production . The annual production is estimated at 1.5 million tonnes valued at about 600,000,000 Naira [4,5]. Cocoyam grows in association with other food and tree crops, a system mostly practiced by subsistence farmers in Nigeria. The bulk of the production of cocoyam is in south east of Nigeria . Nwabuzor also noted that, cocoyam can be consumed in various forms when boiled, fried, pounded or roasted . It can also be processed into chips which have a long shelf life and provides food all year round especially during lean planting season . Cocoyam leaves are also used as vegetable for preparing soup in various parts of the world. There has been a decline in the yields of cocoyam in the past few years and this has been attributed to factors such as climate variation, drought, poor cultural practices among cocoyam growers, pest and disease infestations . Noodles are strips or strands cut from a sheet of dough made from flour, water and either common salt or a mixture of alkaline salt. Noodles consumption represents about 40% of the total wheat flour consumption in East and South East Asia . Noodles are mainly consumed by school children. The use of composite flour has been encouraged since it reduces the importation of wheat. Utilization of locally available, inexpensive materials like cocoyam that can substitute a part of wheat flour without adversely affecting the acceptability of the product will be a product development. This will increase the overall nutrients, encourage agricultural sector, increase noodle variety, reduce dependence on wheat flour for the production of noodles at lower cost of production. The objective of this study was therefore to produce an acceptable instant noodle from a blend of cocoyam starch and wheat flour. Cocoyam tubers, wheat flour and commercial noodles were procured from Igbona market in Osogbo, Osun State of Nigeria. Extraction of cocoyam starch: The cocoyam tubers were washed and diced into cubes into clean bucket of water prior to milling. Wet milling of the cubed tubers was carried out and a little amount of water was added to the slurry and sieved using a muslin cloth. It was then allowed to settle for 4 h. The supernatant water was decanted and the starch was placed in foiled aluminium trays and oven dried at 700C for 6 h. The dried starch was them milled to a powdery form, sieved to pass through a 120µmm mesh and packaged in an airtight container (Table 1). Table 1: Sample Codes and Designation of the composite noodles. Production of instant noodles: The cocoyam starch at the rate of 20, 40, 60 & 80% was blended with the wheat flour on replacement basis in a food mixer, warm water (40oC) and 5% CMC were added to form a stiff dough. The dough was allowed to rest for 20mins. Then kneaded with a rolling pin and manually sheeted to about 2 mm thickness. The sheets were extruded using a cold extruder (Eurosonic, Globe 150) model. This was subsequently cut with a pastry cutter into 10 cm strips, put in cleaned aluminium tray. The resulted noodles were dried at 60°C for 3 h and allowed to cool. The process flowchart is shown below in figure 1. Figure 1: Flowchart for noodles production. Chemical analysis: The noodles from the wheat flour, cocoyam blends and the commercial instant noodles were subjected to proximate and mineral analysis using AOAC method . Carbohydrates were calculated by difference. Minerals like calcium (Ca), magnesium (Mg), iron (Fe) and sodium (Na) contents were determined from their ashes by atomic bsorption spectrophotometry using a Perkin Elmer 300AA spectrophotometer (Perkin Elmet USA). Phosphorus (Ph) content was determined using Vanadomolybdate method . All analyses were determined in triplicates. A panel of twenty tasters comprising of staff and students of the Department of Food Science and Technology, Osun State Polytechnic, Iree were used to evaluate the sensory properties of the cocoyam starch-wheat flour blends and commercial noodles. The panellists were selected based on their familiarity with sensory qualities of noodles and were served in Sensory Laboratory at room temperature (30±2°C). A nine-point hedonic scale was used to evaluate appearance, taste, crunchiness and overall acceptability of the noodles, where 1 and 9 represents dislike extremely and like extremely, respectively according to Iwe method . Water was provided to rinse the mouth between evaluations. All analysis was done in triplicate. Results were expressed in means±standard deviation. Table 2 shows the result of the chemical composition of commercial noodles and those of the blends of wheat flour (wf) and cocoyam starch (cs). Analysis revealed higher carbohydrate (63.50-70.05)%, moisture (4.54-5.07)% and vitamin A (10.01-30.47) mg/100g, B1 (11.43-32.15) mg/100g but lower protein (4.56-8.79)%, phosphorus (0.34-0.52)%, calcium (1.83-0.98)%, iron (0.15-0.32) % and ash (1.19-3.20)%. The level of carbohydrates and vitamin A and B1 in the wf /cs noodles increased with the increase in proportion of cocoyam starch in the blend. This was in agreement with literature report on high contents of starch, beta-carotene and thiamine in cocoyam [16,17]. The control sample had highest sensory scores than all other samples. This may be due to the addition of other constituents of the commercial noodles like emulsifier and stablilizers added to it. Sanni et al. , also reported similar results for noodles produced from cassava/wheat flour. 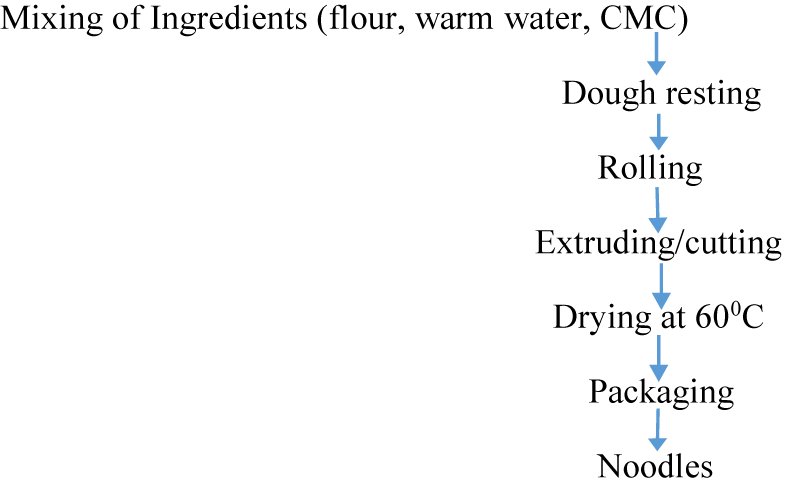 Table 2: The chemical composition of cocoyam starch-wheat flour blend noodles. Keywords: wf rep wheat flour; cs rep cocoyam starch. The mean sensory scores of cocoyam starch-wheat flour blends and commercial noodles are presented in table 3, the mean sensory scores of the composite blends noodles for all the attributes decreased with an increase in the level of cocoyam flour in the blend with the commercial noodles (100% wheat flour) being the most preferred by the panelists. The blend containing 80% cocoyam starch was not acceptable at all to the panelist. However, the noodles containing 20% cocoyam starch compared favorably with the commercial noodles in terms of all the sensory attributes evaluated. Table 3: Means sensory scores of cocoyam starch-wheat flour blend noodles. Samples Color Crunchiness Taste Gen. Accept. Values represent the mean of triplicate samples±std dev, CS rep 0cs+100% wheat, CS20 rep 20%cs+80%wf, CS40 rep 40%cs+60% wf, CS60 rep 60%cs+40%wf, CS80 rep 80%cs+20wf. The combination of wheat flour and cocoyam starch in making noodles resulted in a product with improved nutrients composition and the wheat flour/ cocoyam starch blend at a ratio of 80:20 was the most acceptable among the blends. This implies that wheat flour could be supplemented with cocoyam starch. The production and the consumption of the cocoyam starch-wheat flour blend noodles should be encouraged to increase the calorie intake in the diet, noodles varieties, boost its nutritional content and improve the utilization of cocoyam tubers especially for children who are the major consumers of noodles. Shirao Y, Moss H. Suitability of the Australian wheat and flour for noodle production. Cereal Chemistry Conference RACI. 1978; 37-38. Lorenz K, Dilsaver W. Buck wheat (Fagopyrum escutenlum) starch physico-chemical properties and functional characteristic. Starch Starker. 1982; 34: 217-220. Onwueme IC. Colocasia and Xanthosoma (Cocoyam) in the Tropical Tuber Crops: Yams, Cassava, Sweet potato and Cocoyam Journal of Willey and Sons Ltd. 1998; 589-606. Nwabuzor EC. Nematode problems and solutions of root and tuber crops in Nigeria. In: Akoroda MO, Ngeve JM. Proceedings of the 7th Triennial Symposium of the International Society for Tropical Root Crops (ISTRC). Cotonou. 2001; 545-552. Enyinnia CN. Cocoyam, food self-sufficiency and policy in East and Southern Africa. Food Policy. 2001; 15: 383-394. Asadu AN. Causes of decline in cocoyam production among farmers in Enugu State. Department of Agricultural Extension. University of Nigeria. 2006. Ezenwa AJ. Enhancing production and processing of cocoyam among farmers in Ihiala Local Government Area of Anambra State. Department of Agricultural Extension. University of Nigeria. 2010. Dexter JE. Asian noodles products. In Christian GL, Smith JS (eds.) Food Chemistry, Principles and Application, a Workshop. 1995. AOAC. Official Methods of Analysis of the Association of Analytical Chemists 17th ed. Washington DC. 2000. FAO. Food and Agriculture Organization. Sweet Potatoes Production.109 record. Italy. 2001. Anon. Group says ramen demand to double by 2010. Milling and Baking News. 1999; 51-77.